Islamabad, April 16, 2015: The Centre for Pakistan and Gulf Studies (CPGS) organized an In-House meeting of the Steering Committee for project ‘SALAM – Sensitize, Access, Link, Act, Monitor’, which aims at innovating means to resolve radical extremism in Pakistan. The agenda of the meeting included a review of the progress on the National Action Plan (NAP) and recommendation of measures for the effective implementation of counter-terrorism efforts. The meeting was attended by prominent religious, philosophical and legal experts and practitioners, as well as university students. The Steering Committee recommended that for effective implementation of the National Action Plan, both short and long term strategies need to be identified. A national census must also be held at the earliest. A proper record of foreigners visiting Pakistan should be kept. It was also suggested that ex-servicemen from the armed forces ought to be inducted into the police force, or an equivalent ‘national guard’ for the security of sensitive infrastructure and government organizations. The government must also pay serious heed to working on reforms in the judiciary, health and education sectors. Furthermore, cooperation between provincial and federal governments needs to be improved. President CPGS, Senator Sehar Kamran (T.I.) in her concluding remarks stated that at the moment, the army is carrying the weight incountering terrorism within the country, and that the government must also step-up and assume responsibility for social, economic as well as physical rehabilitation of the internally displaced persons in order for the national counter-terrorism push to be a success. She said rehabilitation without providing basic facilities would only lead to failure. She further said policy-making forums need to be utilized for effective implementation of the National Action Plan. The roundtable was organized as part of the Centre’s Project JOHAR, which aims at promoting a better understanding of the contemporary nuclear debate through converging and synthesizing different perspectives in the second nuclear age. Its aims included understanding the Nuclear Non-Proliferation Treaty (NPT) debate contemporaneously among the participants; critically analyzing its review process and the challenges that the upcoming Review Conference (RevCon) would be facing. Two esteemed experts, Dr. Tughral Yamin, Associate Dean at the Peace and Conflict Studies department, NUST and Munawar Saeed Bhatti, former Ambassador to the EU, Luxembourg and Belgium, graced the occasion and spoke on the subject at great length followed by a spirited discussion on various aspects of the nuclear nonproliferation treaty and regime. The discussion was chaired by former Defence Secretary of Pakistan, General (R) Asif Yasin Malik HI(M). In this context, the issues relating to nuclear disarmament, right to peaceful uses of nuclear energy and prevention of the spread of nuclear weapons were very coherently discussed. The main challenges faced by the NPT review process, i.e., modernization of nuclear forces by P-5, nuclear weapons free zone (NWFZ) establishment in the Middle East, progress on the 2010 action plan of the NPT RevCon and Iran’s nuclear programme were raised during the debate. The ‘exceptionalism’ approach exercised by the international community in implementing the nuclear nonproliferation norms came under criticism. 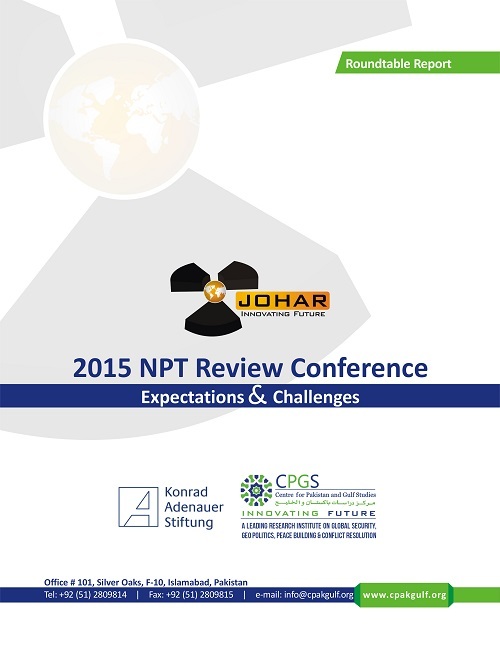 The participants observed that the NPT is seriously eroding because of issues of noncompliance by state parties. The emerging geo-political issues, selective application in implementation of NPT clauses and the recommendations of 2010 NPT RevCons may become a pitfall for the upcoming 2015 NPT RevCon. The roundtable was successful in producing a comprehensive and insightful analysis with the aid ofeminent scholars, practitioners and academics regarding the issues faced by the NPT RevCon process.